Are you irritating your audience into unliking or unfollowing you? Social media is about building relationships with people and nobody likes to be in a relationship with someone who is pushy or who irritates them. But what irritates people online? 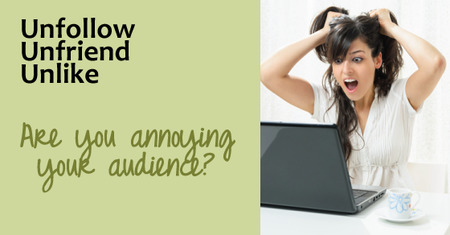 How do we avoid frustrating our audience? We asked our networks what irritates them from brands online and what pushes them to unfollow or unlike a page and we got a lot of great answers. Here are some highlights, grouped by theme. When you have a presence online, people expect you to be there to have conversations. If you post information but never answer questions or respond or acknowledge those that engage with you, people will get irritated and leave. The way you interact with your audience is extremely important. Make sure that you are aware that the tone you use is important and that what you are saying stays in line with what your audience expects of you. Be useful and give value to your customers. Remember it’s about them, not about you. Never stop checking in with your audience, either with questions or through analytics, to see if what you’re doing is working. What makes you unfollow or unlike a brand? And what makes you stay? Leave a comment and let us know! Older PostIs your content useful?